Corel VideoStudio Pro 2019 is a comprehensive consumer video editing application designed with editing enthusiasts, students, social media marketers, and new videographers in mind. The program offers an easy-to-learn and easy-to-use interface and workflow which allow you to achieve results quickly, and at the same time it features a thorough collection of standard and advanced tools and functions that will let you turn your projects into creative works of art. VideoStudio supports up to Ultra HD 4K resolution, so you'll be able to make use of most 4K cameras and 4K displays. 1500+ creative effects, transitions, titles, image correction tools, and other filters are integrated so you can polish up your projects with style and precision. 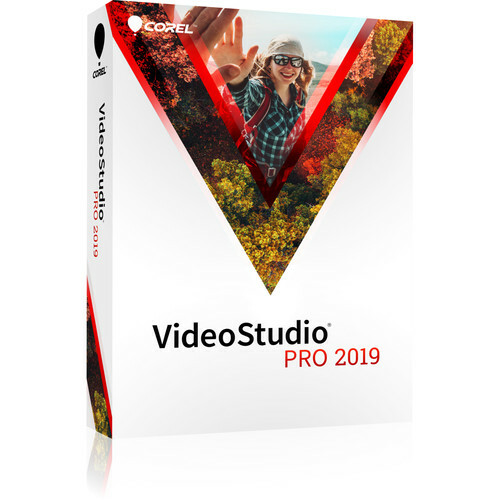 VideoStudio Pro 2019 incorporates a variety of sophisticated video and audio features, including 4-camera multi-cam editing and multi-point motion tracking for those who want to get really creative. Multi-point motion tracking will allow you to easily add moving text or graphics to your videos or apply a mosaic blur to moving faces, logos, license plates, and other elements. The application also includes several 3rd-party plug-ins from NewBlue FX for further stylizing your videos. 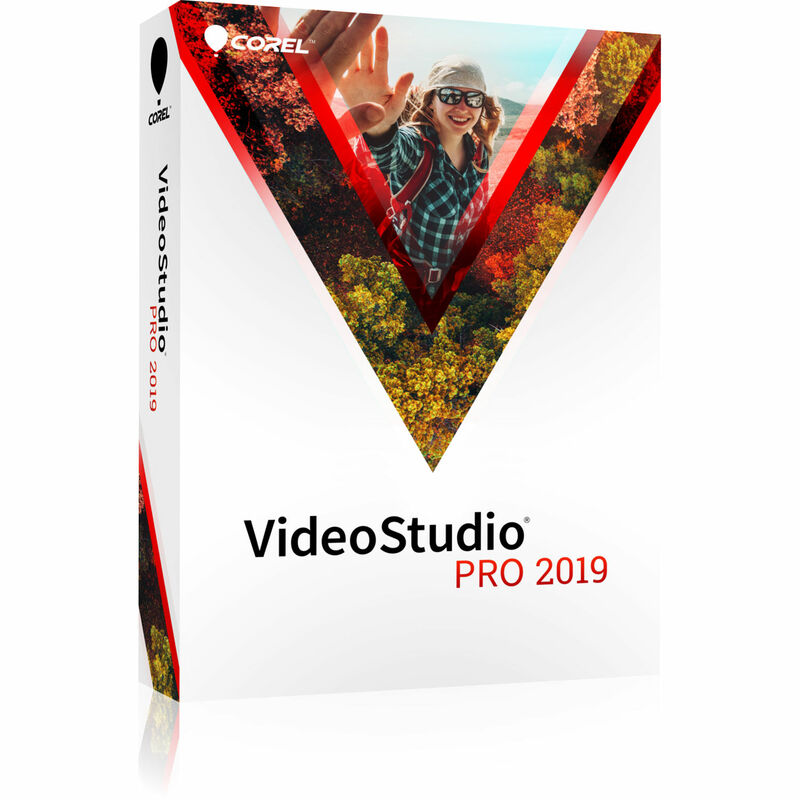 VideoStudio Pro 2019 is compatible with Windows 10, 8, and 7. The default operating language is English but you can choose between a variety of languages in the settings menu. Transform a single image, shape, or sequence and make cuts or transitions between scenes and merge video so that there is no discernible beginning or end. Flip, zoom, spin, or whip between scenes with Seamless Transitions that add energy to your cuts. Just align similar colors or objects to create a smooth and artful transition between imagery. Choose from transitions templates for immediate results or dive in deeper and create custom Seamless Transitions. Create new Tiny Planet or Rabbit Hole effects with the 360 video editor. Create your own unique overlays and export motion graphics, masks, or text with a transparent background, all using the new alpha channel. Create your video on the overlay track and export to .MOV with alpha channel. Boost colors and correct the color in your picture in a few easy clicks. Fine tune highlights, saturation, clarity, and more with new, intuitive controls. Bring out the colors in your video with hue, saturation, and white balance controls, including auto-tune adjustments. Match the lighting between two clips, warm up the tone of your video, and more. Create and customize the movement of graphics, shapes, titles, and overlays along a defined path with new flexible controls. It's the perfect way to create a fun effect or emphasize elements in your video. Introduce and tell your story with style. Create stunning titles with motion, text, and graphics in the enhanced Title Editor. No matter what you create, save custom titles in the library to spare cycles on future productions. Plug in your camera and capture your animation frame by frame. This feature has support for all popular Canon and Nikon cameras and controls to help you capture your stop motion animation. Quickly remove distortion from wide-angle/fisheye cameras or action cameras with new and intuitive controls. Zoom-in on the action, pan across a scene, and apply visual pan and zoom effects to your videos across custom motion paths. Show multiple video streams simultaneously with Split-Screen video templates. Easily drag-and-drop content to create impressive promotional videos or share the highlights from your latest trip. Import your 360° footage and start editing. VideoStudio 2019 offers support for popular 360 cameras as well as exporting your 360 video directly to YouTube, your VR headset, and other destinations. Quickly crop video, resize, and position your media directly in the preview pane. Snap your media in place with new Smart Guide alignment tools. VideoStudio supports most of the latest common file formats and associated peripherals, now including XAVC-S authoring to an SD card so you can export your video for playback directly on your camera. VideoStudio is optimized for the latest video hardware acceleration technologies from Intel and NVIDIA, which provides for a more efficient workflow and dramatically speeds up rendering to popular file formats. The Program Is Available for Installation in 64-Bit Only.